The Lucky is a dual blade folding knife from Cold steel. 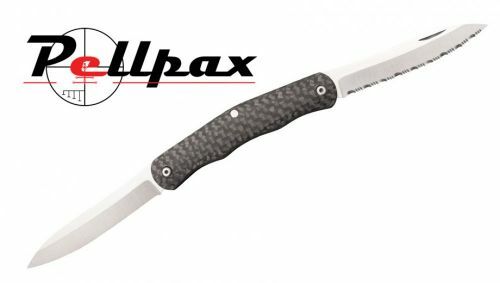 It's extremely strong blade and grippy handle ensures this knife can take on a plethora of jobs. Forged with XHP Alloy the blade is very durable. XHP is a carbon steel which gives it unmatched strength as well as a high resistance to chemicals, rust and general wear helping to prolong your blade's life. The Drop point shape makes this knife great at piercing, slicing and cutting though materials with ease. The blade has then had a Mirror finish applied to give it the high end look. The handle of the Lucky knife is made from Carbon Fiber making it both light and strong. The handle shape incorporates 3 grooves along the bottom to increase your grip over the knife for increase accuracy and reduce the risk of injury. The handle is fitted with a right handed pocket clip for transport and accessibility. The most notable feature of this knife is the twin blades. One blade has a serrated edge idea for cutting or sawing tough materials whilst the plain edge on the second blade is best at slicing and piercing. Weighing only 1.20z this knife offer a light weight, efficient and beautiful way of carrying out your cutting jobs.